YPY Math Catcher PRO is a multi-currency trading robot, which uses a mathematical strategy of balancing the trade volume and performing automatic trading with real Take Profit and Stop Loss levels. For diversification, the EA balances the trade volume within a portfolio of independent trading strategies, including trading in short-term and long-term trends, trading based on strong levels. The EA trades all these strategies at a virtual scope, aggregating virtual orders into real orders opened on the account. You can read about the aggregation in the blog. This trading system used a gradual dynamic lot in trading, but with various limitations and forced closures. This is fundamentally different from the martingale system, since this expert will not wait forever for the price to roll back and will always strictly limit losses. The cost of rent will periodically increase with the increase in profit at the developer's signal monitoring. Easy to use, no needless settings. Protective real stop loss and take profit levels. Additional protection against abnormal movements of the market price. Pausetrade - when this mode is enabled, the trading complex continues maintaining existing orders without looking for new entry points in order to progressively complete the trading on the account. Stoptrade - when this mode is enabled, the trading complex immediately completes the trading by closing all of its orders. AutoMM - system for automatic calculation of lot size based on the free equity, taking the deposit currency into account. Closing the EA orders in any other way is prohibited, as well as the transfer of the EA to another terminal without the files it creates in the MQL4\Files folder. VirtualLot - Auto (the size of the virtual lot is calculated based on the equity) / Fixed (allows you to fix the size of the virtual lot to value of the initial equity in the strategy tester). MaxDrawdown - maximum total equity drawdown of all orders in the deposit currency. When this drawdown is reached, all orders on all instruments are closed (trading will be resumed on the next trading day). GMTOffset - users are required to enter the actual shift of the trade server relative to GMT in hours. MinLeverage - minimum leverage required for opening new orders. MinMarginLevel - minimum margin level of the account as a percentage, which is required for opening new orders. Slippage - maximum allowed slippage when opening orders. Testing, determining risks and instruments used for each new version of the EA is up to the user. It is recommended to check out the EA operation in the strategy tester of the terminal and on a demo account. The EA uses explicit control of bar opening. It is recommended to always use the latest version. To update, it is sufficient to download the latest version of the EA and attach it to the chart instead of the older version. All previously opened orders will be maintained by the new version accordingly. The EA should be attached to charts of each traded instrument individually. The product does not comply with FIFO. Any broker and any account type. Recommended leverage is 1:100 and higher. Limitation on the number of simultaneously opened orders on account not less than 200. Minimum / Recommended deposit is $1000 / $10000 and above (cents for cent accounts). Обращаем внимание пользователей на то, что начиная с этой версии мы формируем портфели по собственной авторской технологии вероятностной оценки торговли в будущем на текущем рынке, то есть не пытаемся показать максимальный результат при тестировании на истории. Прекращается поддержка инструмента EURJPY, EURUSD. Corrected the notification on insufficient history of quotes. Disabled the leverage check (MinLeverage) when testing in the strategy tester. Given the peculiarities of the current market, we have conducted a serious study. Starting from this version, a new improved core of the trading logic is introduced to increase stability as well as effectiveness of trading. AUDCAD is no longer supported. 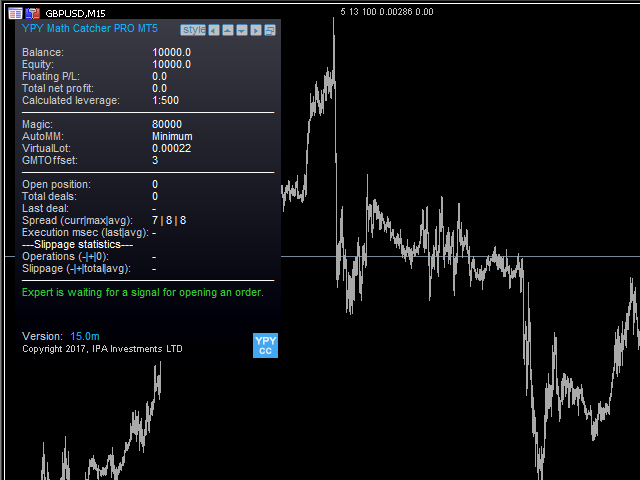 The new version additionally supports trading on EURUSD. Significantly improved the trading logic in order to increase the stability of trading. Due to these changes, the integrated automatic protection that limits losses will be triggered much less frequently. The portfolio of the strategies used in this version remains the same, so that users can independently compare the trading results of the new and previous version. This allows seeing the result of improving the trading logic on the current history period, which was not included in the optimization period (up to February 2018). Additional significant improvements in trading logic are planned for the next versions, which will increase the efficiency of trading (currently in the active phase of the final testing). Performed global update of all virtual strategies for all instruments in order to adapt the EA to the current market. Optimized the code in order to increase the reliability and/or to improve the operation speed of various blocks of the trading system. Performed additional adaptation of the EA to the trading conditions of various brokers. Optimized for the new terminal build. Performed global update of all virtual strategies for all instruments in order to adapt the EA to the current market. Significantly increased effectiveness and frequency of trading. Added support for the new feature "Safe StopLevel" (ratio of TP to SL is 1:1/10), which allows using a real protective stop loss level ten times smaller. This allows reducing the losses by 10 times in case of disconnection from the trading server or broker, and also in case of strong anomalous price fluctuations. This feature is active by default. Performed optimization of the code to ensure compatibility with the trading conditions of various brokers. Global update of all virtual strategies on all instruments in order to adjust the Expert Advisor to the current market. Optimized for the new build of the terminal.